For just £10, participants will receive their very own Santa outfit for the 5K loop and will be helping raise vital funds for the North West Air Ambulance Charity. The event (9 December) is being arranged in partnership with Blackburn with Darwen Borough Council, Blackburn BID, The Mall and Pennine Events. Joining the crowds will be Blackburn with Darwen’s Chief Executive, Harry Catherall, who will don his running shoes in aid of the good cause. 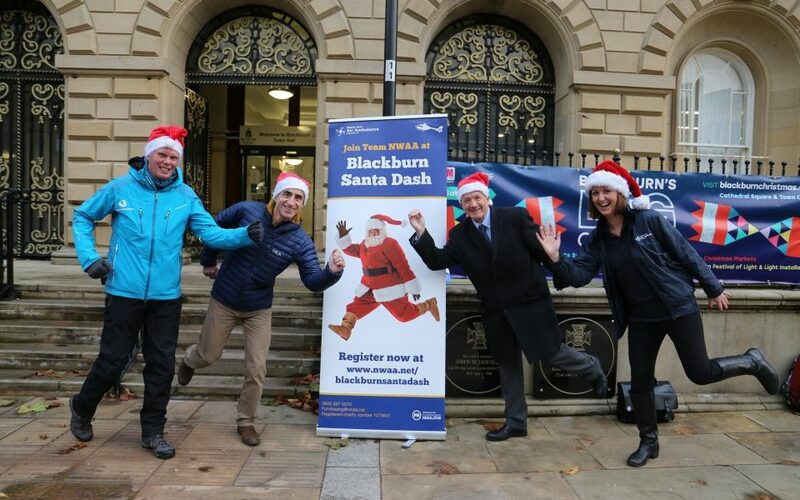 It’s fantastic that Blackburn is set to host its very first Santa Dash. What a sight it’ll be with runners all dressed as Father Christmas taking to the streets of the town centre to help raise money to support the North West Air Ambulance Charity. The run is open to all residents – whether you’re experienced, a beginner or a family looking to get into the festive spirit for charity. The fun run will aptly start and finish at Blackburn’s Christmas Market in Cathedral Square – and will take place between 11am to 1pm. On the day, the 26 German chalets will be open along with fairground rides for children. The route itself will take the Santas across the town centre – travelling along Jubilee Street, Darwen Street, around the perimeter of The Mall and then down Railway Road 3 times. If running isn’t your thing you can walk, jog or even volunteer to collect donations on the day. We really wouldn’t be here without the generosity of our supporters in the North West helping us to raise the £8.5 million needed each year. Just last month alone, we airlifted 77 patients in the Lancashire area. The largest number of missions we attend are road traffic collisions and we’re able to transport highly experienced paramedics, doctors and A&E treatment right to the scene. This can literally make the difference between life and death. If participants would like to collect additional sponsorship for the run, they will be sent a NWAA t-shirt as part of their fundraising pack. This exciting new Santa Dash is a wonderful and special opportunity to run, jog or walk around the centre of Blackburn on traffic-free streets with like-minded festive folk. We are really pleased to be able to bring this event into the middle of Blackburn and look forward to greeting hundreds of sporty Santas on December 9th. The registration fee is £10 for adults, £5 for children and under 5’s and dogs are free. Children in prams are welcome too. Adults and children over six will receive a Santa suit as part of the £10 entry fee. This new event in Blackburn’s BIG Christmas events’ programme will make a dashing spectacle through the town. We hope it will be a great family event for everyone and that it will raise vital funds for the North West Air Ambulance Service Charity. On your marks! Get set! Ho Ho Ho! Visit the NWAA’s website to register and find out more.